Scientists like to classify lakes and give names to the different lake types so they can be easily referred to. Trophic states are based on lake fertility. The root “trophy” means nutrients; therefore, lakes are classified based on the amount of available nutrients (Phosphorus and Nitrogen) for organisms. More fertile lakes have more nutrients and therefore more plants and algae. Most of the lakes in Minnesota were formed as the glaciers receded, carving out basins in the landscape. In these newly formed lakes, the edges and bottom are exposed rock, which doesn’t erode very quickly, meaning there are not many nutrients available. As a lake ages, sediment from the watershed is washed in, filling in the bottom of the lake. This sediment is rich in nutrients, and therefore also increases the fertility of the lake. “Oligo” means very little; therefore, oligotrophic means very little nutrients (Phosphorus and Nitrogen). Oligotrophic lakes are usually found in northern Minnesota and have deep clear water, rocky and sandy bottoms, and very little algae. The fish found in oligotrophic lakes like cold, high oxygenated water, examples include lake trout and whitefish (more information on fish). In oligotrophic lakes, oxygen is found at high levels throughout the water column. Cold water can hold more dissolved oxygen than warm water, and the deep region of oligotrophic lakes stays very cold. In addition, low algal concentration allows deeper light penetration and less decomposition. When algae, zooplankton and fish die, they sink to the bottom and are decomposed by microbes and invertebrates. This decomposition process uses up oxygen. Since oligotrophic lakes are less fertile and have less algae and other organisms, there is less decomposition and the oxygen doesn’t get used up. “Meso” means middle or mid; therefore, mesotrophic means a medium amount of nutrients (Phosphorus and Nitrogen). Mesotrophic lakes are usually found in central Minnesota and have clear water with some algal blooms in late summer. Mesotrophic lakes are great fishing lakes and are home to many sport fish such as walleye, perch, smallmouth bass, muskellunge and northern pike (more information on fish). 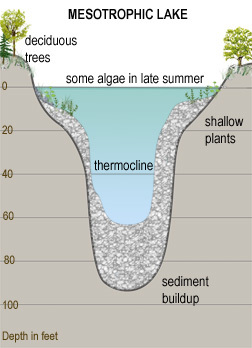 Mesotrophic lakes behave differently than oligotrophic lakes in that they stratify, meaning they separate into layers in the summer (more on lake stratification). The top layer of water becomes warm from the sun and contains algae. Since the by-product of photosynthesis is oxygen, oxygen concentration remains high at the surface of the lake. The bottom layer remains cooler and can become anoxic in mid-summer. This change occurs because as all the algae and other organisms die and are decomposed at the bottom of the lake, oxygen gets used up. Since this bottom layer of water does not mix with the top layer of water in the summer, oxygen cannot be replenished. The implications of anoxia are that no fish or other organisms can live where there is no oxygen; therefore, in late summer, fish move shallower where there is still oxygen available. “Eu” means true; therefore, eutrophic literally means true nutrients or truly nutrient rich (Phosphorus and Nitrogen). 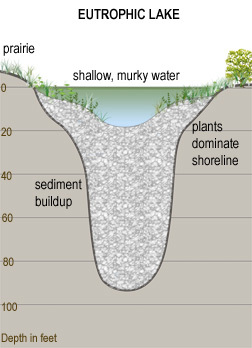 Eutrophic lakes are found in southern Minnesota where the soils are more fertile and where there is a lot of farmland. Eutrophic lakes are shallow and have murky water and mucky, soft bottoms. They also have a lot of plants and algae (more information on eutrophication). Eutrophic lakes are very fertile from all the nutrients carried into the lake from the surrounding landscape. These nutrients (Phosphorus and Nitrogen) support high densities of algae, fish and other aquatic organisms. 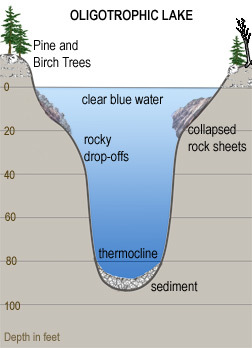 Since eutrophic lakes have so much biomass, there is a lot of decomposition occurring at the bottom. This decomposition uses up oxygen, causing the bottom of the lake to become anoxic in the summer. In very shallow lakes, the whole lake can become anoxic, causing a fish kill. Fish, invertebrates and other organisms need oxygen to survive. One drawback of defining trophic states as certain divisions in the trophic state index is that each lake is different. The trophic nature of a lake depends on many things including depth, area, watershed size, adjacent land use, and climate. A lake with a TSI of 49 falls on the borderline between mesotrophic and eutrophic, and there is some overlap. Trophic states should be considered a general definition of lake condition. It is important to remember that lake trophic state is not interchangeable with water quality. Water quality is subjective and depends on how you intend to use the water body. A lake that is good for duck hunting is not necessarily good for water skiing. In turn, a lake that is great for swimming may not be great for bass fishing.